The data service is free to use and is hosted on the website www.merrbys.co.uk, where users can access wind measurements taken by a specially designed Global Navigation Satellite System (GNSS) receiver hosted on SSTL’s TechDemoSat-1 satellite, which collects GNSS signals, such as GPS, reflected off the surface of the ocean. TechDemoSat-1 is also collecting GNSS reflections off land and polar regions, opening the door for new applications of this technology, such as soil moisture and ice measurements. TechDemoSat-1 was launched in 2014 and carried eight payloads from different UK organisations. On successful completion of the satellite’s original mission, a life extension now allows the GNSS Reflectometry payload to be operated 24/7 continuously. On-board processed GNSS-R data is relayed to SSTL’s ground station in the UK and inverted for geophysical parameters using NOC retrieval algorithms to estimate near-surface ocean wind speeds. Users have access to data from the past three years and new data are added daily with a latency of 30 days. Users can also register for a fast service allowing retrieval of data with a shorter delay - currently 48 hours - but with a target of less than 24 hours as the service matures. 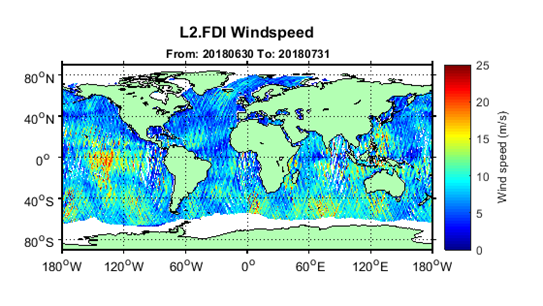 The current service is a pilot demonstration showing the potential for a new source of wind and wave measurements from a small orbiting satellite. In future, a constellation of low-cost small satellites carrying enhanced instruments could provide measurements in near-real time to support weather and wave forecasting. The TechDemoSat-1 satellite and payload were supported by the UK Centre for Earth Observation Instrumentation and the UK Space Agency, and sponsorship from European Space Agency has allowed the release of data. Over 50 international journal papers have been published based on use of the TechDemoSat-1 GNSS-R data. SSTL also provided the same GNSS Reflectometry instrument to the NASA CYGNSS mission, where eight small satellites are using this technique to probe and analyse hurricanes. In February this year, NOC scientists published a research paper in leading science journal Geophysical Research Letters detailing a new technique that, for the first time, used reflected GPS signals from orbiting satellites to measure very high wind speeds and changes in near-surface ocean conditions during hurricanes. The pioneering research drew upon data gathered using SSTL GNSS-R instrument mounted on the TechDemoSat-1.